Candy Addict » Candy Review: 3 Musketeers Mint with Dark Chocolate: Secret Agent Bar? 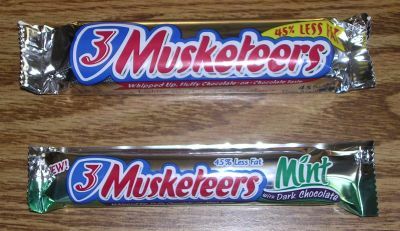 Candy Review: 3 Musketeers Mint with Dark Chocolate: Secret Agent Bar? I think the next 007 should be the 3 Musketeers Mint Bar with Dark Chocolate because it’s a master of disguise. Have you encountered this confectionery spy? It sits on the candy shelf at the checkout line of your local supermarket, hoping to be your impulse buy of choice. Masquerading as a normal candy bar, it dwells between its cousin original 3 Musketeers bar, and its wacky neighbor, Snickers. Still, Agent 3 Musketeers Mint continued to charm me with the promise of smooth dark chocolate with a cool, minty center. With my well-documented weakness for chocolate mint treats, I was unable to resist the allure of 3 Musketeers Mint. With my first bite I realized that this super spy was not finished with its deception. While clearly related to its cousin 3 Musketeers, the center of Mint is decidedly softer than its traditional counterpart. I cannot decide if this is a good thing or not. Even more confusing is the lack of a distinct mint taste. Sure, that cool tingly feeling in my mouth is telling me that I ate something minty, but my discerning taste buds know that it’s simply a high-tech trick of that master of deception, 3 Musketeers Mint. Why must you deceive me so? Despite the turbulent nature of my relationship with 3 Musketeers Mint, I suspect I will rendezvous with it again in the future. While it is not everything I wanted or expected from such a bar, it’s really not a bad candy bar. Let me put it to you in Bond terms: it’s not Sean Connery, but it might be Pierce Brosnan: pleasant, attractive, and enjoyable enough in its own way. I am also a big fan of all things chocolate mint, as well as a big 3 Musketeers fan, but I’m not sure I want to see them together either. Is it really a 3 Musketeers if it’s covered in dark chocolate and filled with mint? It’s a candy bar identity crisis of sorts. And the whole “it’s two little bars in one shiny wrapper” scam has been driving me crazy ever since I got into Mounds bars at age 3. Still: I really want to try this! How can it have 45% less fat if it’s a new bar? I hate it when they do that. makes me want to choose the york peppermint patty or the original three musketeers – but definately not the mint three musketeers! why i love to make myself a mint julep drink each night and consume one of these lovelies!! it complements my southern cocktail quite nicely and provides sensible nourishment. i mean i love the peppermint patty and all but come on! we are talking a MINT MUSKETEER people! not a THREE MUSKETEER but a MINT MUSKETEER. The wrapper says “whipped up, fluffy chocolate-on-mint taste.” It isn’t horrible for a 150 calorie candy bar. Small and not fully satisfying… but okay in taste. I put on some Burt’s Bees Peppermint lip balm to further simulate that I was eating a really minty treat. It helped a lot. bring on the york, andes and juniors. i don’t think i would like this. if i am doing the two fun size candies, i’ll do the mounds! This is like taking a bite out of a york peppermint pattie and have it linger throughout your experience while you eat a three musketeer. I enjoyed it, the packaging is pretty, and I was bummed not to see them anymore when I went to walmart on friday. They would be good in a blizzard at dairy queen! I like them. Some mint candies are a bit strong for my taste, and I particularly enjoy the light, lingering feeling much more than “mint burn.” The first time I tried these it was from a bag of itty-bitty ones we got at Rite-Aid. (Not our usual pharmacy, but we just went to pick up some stuff since we were in the area.) I was looking through the candy aisle, and saw these babies. Along with other candies we got these. These are the ones that really stick out in my mind. The next one I got was at a Love’s Travel Stop with a Hardee’s connected to it. I was coming back from Camp Hopen, and we got some dinner at Hardee’s and the bars at Love’s! Both great times for me! This is a great candy bar, but I’m disappointed by how cheap they are being with the size. It’s only 35 grams, compared with 60 grams for the regular 3 Musketeers. I just had one of these and i think they are great! Plenty minty for me. Maybe a tad too sweet though. Still, very good. I want to know where to find the mint musketeer because my local neighborhood walmart does not have them. I want to try one! I LOVE the three musketeers mint! I can get them three for a dollar at the local Grocery Outlet, but I have also noticed them (“new!”) at Walgreens lately. Walgreens is a little behind the times. I like how soft they are and to me they seem extremely minty. Maybe it’s because I eat two bars at once a lot of the time, but afterward I can feel the mint burning inside of my chest! I think I’ll stick with the juniors…..I seen these advertised on t.v. & couldn’t resist. Had hubby pick up a couple & was extremely disappointed. As you pointed out, it’s not a candy bar….it’s 2 bitty pieces. I was expecting a three musketeer except the inside would taste of mint. Nope, that’s not the way it is & they’re aren’t getting my business for that anymore. Hubby paid .79 each for these….not worth it. I’ll go online to the bulk candy shops & stock up on Junior mints.